Published by Cartoon Books. Written and illustrated by Jeff Smith. The Deal: It's the latest issue of Jeff Smith's relatively new comic book, which, so far, chronicles the adventures of a dimension-jumping art thief. The Good: Folks who followed Smith's work on the acclaimed fantasy series Bone, which is basically a cottage industry in itself these days, already know that he's a master of sequential art. His work in Rasl shows off a masterful command of storytelling (which in the world of comics refers to the flow of action from one panel to the next) and some of the most confident pen-and-ink work in the business. From a story standpoint, his dialogue is sparse, effective and damned scary. The Bad: I love the mystery of Rasl, but it's unfolding rather slowly. I mean, this issue was entertaining, but readers probably won't be able to see the significance of the story until later when things are fleshed out more. On top of that, this book has some real late issues ... or at least I think it does. 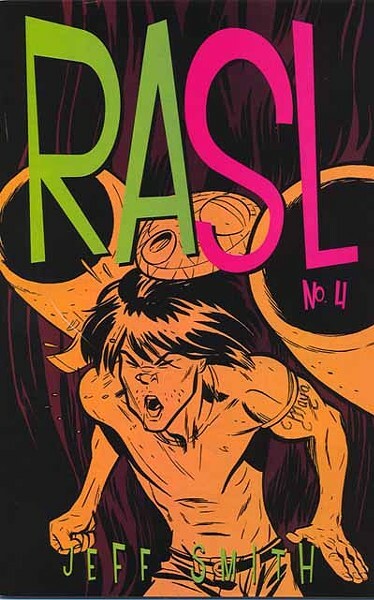 From what I've read, Rasl is supposed to be a quarterly comic, but it feels like it comes out much more sporadically. Maybe it's me. At any rate, the long lag between issues makes it hard to remember what happened the previous issue. The Verdict: It's a cool book, but I wish it came out more often. Reviewed materials provided by Heroes Aren't Hard to Find: www.heroesonline.com.